Living in Beijing - My Beijing Life: What is Chinglish? Every tourist visiting an Asian country (generally Japan or China) feels compelled to take pictures of the mangled English that appears on street signs, restaurant menus, clothing and pretty much everywhere. Technical manuals and signs at government buildings are often victims of direct translation errors. Phrasings are translated directly and, as a result, the English is often confusing. Occasionally these are funny, but usually a non-jackass can easily determine the intention of what is being said and life goes on. Graphic example to follow. This may come as a surprise, but traditional Chinese poetry and calligraphy uses no punctuation or spacing. In fact, punctuation beyond the full stop and the comma are relatively recent additions to written Chinese. Wikipedia tells me that full stops and comma's were used in scholarly annotation, but were often omitted. This means that spacing and punctuation are NOT first nature to Chinese language speakers. This leads to a fun type of Chinglish error, "thenospace or awkwa rdspac ingerr or". These errors really look like someone took an entire English sentence, removed the spaces and then randomly reinserted them. This is becoming less and less common as punctuation (and to a much lesser extent spacing) are becoming more commonly used and English is becoming more wide-spread. I'll keep an eye out for a good one of these and edit this post. EDIT: Looking through some old pictures, I realized I had a combo error. This definitely includes spacing issues, and probably some character transposition errors as well. The characters read 省心楼, which could translate to "no worries tower". It appears someone took liberties and called it The Retrospection Tower, only to have their words mis-spaced and improperly transcribed into "THERETRDSPECTIENTOWER". Unfortunately this is, by far, the most common type of error I encounter. Luckily its the funniest. This occurs when a typesetter, signmaker or textile manufacturer manages to incorrectly copy one or more of the English letters from a piece of paper onto the magazine, sign or garment. Some may be semi-intentional, like the multitudes of fake Calvin Klein floating around the streets with horrible names like Galvin Kloin Galvln KIein. I've also seen some Ralph Lauren called : Pclo Olub - Palo Team. 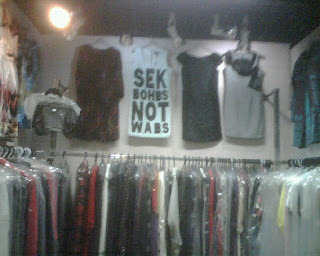 If you can't read it, it says SEK BOHBS NOT WABS. I find it FASCINATING, that someone able to memorize over 10,000 unique characters manages to mis-transpose one of the 26 characters in the English alphabet. I think my hit-miss ratio of transposing Chinese characters I don't know is MUCH higher than that.